Q: We have several watchmaker's on-staff-- is there a way that I can tell which products I order go with which watchmaker? Can I code them for specific jobs? A: Yes! We've added Work Order Numbers to keep track of this for you. This should allow you to know what part is for which customer/job. You will find the work order field on the products page. Work orders will also appear in your basket, in the order history (inside the account tab) and on your order confirmation email. Please note it will not appear on your final invoice that you receive with your package, so you will need to keep/print your order confirmation. Q: I've forgotten my password. Is there an easy way to get it? A: Yes! In the box or tab where you Login, there're a couple of lines: "Can't remember Login?" and "Forgot Password?" By clicking on those, you can retrieve your user/password. Put your Login in the box and check the radio button "Email me my Password" and your password will be sent to you via email. Q: I've forgotten my Login. Help! A: That's easy, too. 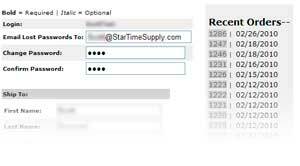 If you ever forget, your Login is the same as your Star Time Account Number (6 digits, usually 3 letters and your area code); alternatively, you can always use your email. In the box or tab that you Login, there're a couple of lines: "Can't remember Login?" and "Forgot Password?" By clicking on those, you can retrieve your user/password. Put your email address in the box and press the "Retrieve Login" button. Your Login will appear on the page. A: You can't change your Login--we use it to tie into our accounting system so that your orders flow quickly and error free. You get your permanent Login (account number) with your first purchase with us. A: Yes! Password must be at least 4 digits long. We recommend changing your password anytime it might become discoverable (email messages, etc.). It's also good practice to change it on a regular basis (every 3 to 6 months). To change password, click on the "Account" tab at the top of any page; You'll need to put it in twice (double check) and "save". Q: I want to change some details on my account. Can I make changes myself, or do I have to call you? A: You can make changes to your account anytime! Select the "Account" tab from the top; update any of the fields you need to. If you are changing address info, please contact us as well so we can update your information in our accounting software. Q: Why Must Liquids Ship Separately? A: In some cases, liquids are hazardous and there are shipping regulations about how they ship. There have also been enough leaks onto valuable merchandise for us to decide to ship most liquids separately. Our systems will split your order for these separate shipping methods avoiding the need for you to place separate orders as has been necessary in the past. Q: Why can't I add to my web order after I've submitted it? A: Our web order fulfillment process is both rapid and automated. Once your order is submitted, it is usually immediately filled. This gives us no opportunity to change your order. It's a very cost effective process that helps us keep our prices highly competitive, but it means if you wish to "add" you will need to place another order. Q: I place orders for several of our locations. Is there a way that we can have one account with multiple ship-to's and a single Bill-to? A: Yes! Before your place your order, select the "Account" tab from the top; near the bottom of the page is an "Add Alternate Ship-to Address" button: Click that, and complete the fields. The Nickname is how you will call up the alternate address later, so use a name that will distinguish it. Then when you go through the order checkout process, use the pull-down to select the alternate ship to. You can also delete or edit your Alternate Ship-To from the Account Tab... just select the appropriate button. Careful with the "Remove" button-- there is no "are you sure" second chance-- once you click delete, it's gone. A: Try using the "search" box (on just about every page) or the search tab, at the top of the page. There's a check box for "Old Product Code" -- if you can't find it the first time, make sure that checkbox is selected; it does a search on the old product codes and returns the product you're (hopefully) looking for. Q: When I Login to my account, I don't see the web prices, and I'm not sure how to place an order. Help! A: If you've previously registered an account and can no longer see prices your temporary account has probably expired. Please call us Toll-Free at 800-927-7664 or email us here to reactivate your account. Once you place your first order your account will become a permanent account. You will also not be able to place orders if we don't have the information necessary to process your order, like your name of shipping address, so before calling be sure this information is in your account. You can edit your account details under the 'Account' tab at the top of each page. 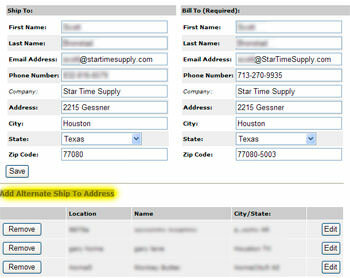 Q: I've got a wholesale account with Star Time; when I looked at my invoice, I was charged sales tax; Why? Q: I've been a customer of Star Time for a while now; you've always used my credit card on file. Can I do that on the web? A: Yes! When you checkout, on the page where you tell us which shipping method and payment method, you can request that we put your Credit Card on file. We don't store your sensitive info in your account; it's held in our accounting system that is not connected to the internet. Q: On my invoice that I got with my package, I'm showing one number, and the email I got after I ordered has another number. Which is which? A: We use two separate systems-- the web to collect your order, and our accounting system to bill the order; hence the two numbers. The web will generate an order number (5-6 digits), and our billing system an invoice number (6 digits). Apologies for so many digits! Q: Can I view my old orders? Is it possible to place a reorder? A: Yes to both; from your "Account" tab, you can select a recent order by the order number. When you click on the order number, you'll be taken to the Invoice Page where you can review your order, or any of the most recent orders (up to 15). From the Invoice page, with the order you want to reorder showing, press the "Reorder" button (just above the "Recent Orders" on the Invoice page). Your order will be loaded into a new basket; you can update quantities and remove items you don't need from your basket. If you find yourself ordering the same stuff on a regular basis, this can be a real time-saver! Q: Sometimes I need to put an order under a different credit card for tax purposes. Can I do that? A: Yes! Simply select Visa, MasterCard, Discover or American Express. Then fill in the requested information on the following page [Note: for security purposes, your credit card info is not stored in your on-line account, but is held in our accounting system that is fire-walled away from the internet]. Q: What's the process for returning damaged product? Q: How can I be sure someone won't steal my credit card information? A: Several reasons: First, we don't store your credit card on our web system; the down side of that is that you will have to enter it each time (unless you opt for our Credit Card on File option; see above). The plus is that it's not available to hackers. The credit card info is associated with your order, but is only available on the administration side, not on the web side. Third, when you place your order, you'll notice you're in a secure web page (designated by the prefix 'HTTPS'). As opposed to email and regular web pages, your information is encrypted. Your personal information is also behind secure pages.